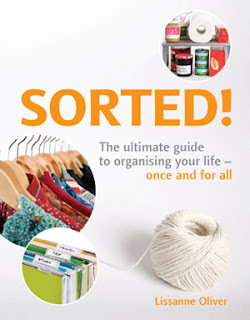 Jeri’s Organizing & Decluttering News: New on My Bookshelf: Sorted! Australian professional organizer Lissanne Oliver was kind enough to send me a copy of her new book - and I'm glad she did! Part of the fun in reading this book was simply observing the differences in language and products from country to country. I now know about Texta, op shops, and blu tack. The truth is that organised people do not have the organising fairies visit. Organised people spend time planning and often have routines in place. Don't hoard generic gifts such as perfumed talcum powder, body wash and little candles or picture frames. A gift with no thought is no gift at all; it's landfill. The book provides general principles and techniques, but the bulk of the material is a collection of 42 "recipes" for organizing every part of your life, from e-mail to paper to memorabilia to suitcases to pantries. Lissanne may be the only organizer I know who has never owned a file cabinet - which illustrates that there's no one right way to get organized! (She prefers lever arch files - another product you don't often see in the U.S.) And that leads to my one minor quibble with the book: sometimes it presents a single way to organize something, when I would rather see a series of options that someone can choose among. But there's much wisdom in this book, and it's a fun read. I can't wait to meet Lissanne (hopefully at the next NAPO conference) and get her to sign my copy! Update: I did meet Lissanne at the conference; in fact, she was my roommate. What a delightful person she is, too! "A gift with no thought is no gift at all; it's landfill." I roared with righteous laughter when I saw this quote - so true, so true! But it's good to know that there are some people who appreciate the "perfumed talcum powder, body wash and little candles or picture frames" - I know because these kinds of items fly right off of Freecycle whenever I post them! Blue Yonder, I've had the same experience with Freecycle - unused soaps and lotions and such get snapped up right away, as do candles. They were clutter to my client - who may indeed have received them as a gift - but someone sure wanted them! Jeri, I loved your appraisal, but I beg to differ on the "one way to do things' criticism: there are 16 'recipes' solely to deal with paper... is that not more than one way to skin a cat?! Lissanne, I was referring to something like your "recipe" for recipes, where there is one option presented which involves using a display book. Many other times you do indeed provide a number of options.